I used one for many years, having used almost all the other AF and AI versions before (an also the UW 50mm Micro). I sold it to buy a newer AF-S, because (I thought) the focusing would be better and faster for my UW work. Not only it was not, but also the newer lens was not so sharp or contrasty as the older version. Had this lens for almost a year now. I find it is very sharp, and also makes a great pottrait lens. As this was my first foray into Macro...I wanted to spend as little as possible yet still have quality glass. THis was my choice. Would I purchase it again? Probaly not. With the expereince I have now, I would choose the 105mm macro to give me some more working room at 1:1. I bought the old 'D' lens and find that it 'hunts' A LOT! Even when not using at close range. And the screw driven motor is loud. I assume these issues have been dealt with on the newer version. Great lens if you enjoy Macro photography. It's a great start-up micro lens. Very sharp. Better bokeh than the 105mm (at least the AF-D, the AF-S seems to be quite nice). 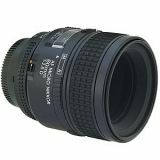 Alternative to this lens for macro would be a 50mm 1.8 with extension tubes (great combo as well). Keep in mind that the effective aperture changes, so the 2.8 at infinity becomes a 5 at 1:1. None-the-less, it's a great lens. Highly recommended. My favourite lens at he moment. Very nice feel to it, good build quality, certainly a step above your average AF Nikkor though perhaps not quite up there with the Pro series lenses. As most users will tell you working distance is fairly tight, so photography of small nervous animals, especially without blocking available or flash light is tricky, but certainly do-able. Don't forget makes an ideal portrait lens (90mm equivalent view on a DX body). Update June 10th. Yes, unfortunately this lens puts everything else to shame. Now I have the problem of finding similar quality in wide angle and short telephoto. Not easy. Sadly I simply cannot bear to use my 18-75 any more - it just doesn't stack up in comparison. Now I know why the professionals use prime lenses. Bought one of these to try with my D200. Only had it a few days but initial impressions are very favourable. Much better background 'bokeh' compared to zoom lenses, and very sharp and precise. I already have a feeling that this lens will spend a lot of time on my camera.